This is my entry for Tuesday's Color challenge over at The Outlawz. This week's color combination is Apricot, Dusky Pink and Cream. The added twist is to use 3 or more layers. For this card, I used another spectacular Doodle Pantry image. This set is called I Will Survive. Here is a picture of all the wonderful images you get in this set. I didn't use a sentiment on the outside of the card because I think the image speaks for itself. But, there is a wonderful quote from Emily Dickinson that comes with this set that I used on the inside of the card. I took one of Laurie's pre-colored images, removed the colored background and printed it on ivory card stock. I re-colored the image using Copic markers - Y15 for the bird's body; YR14 for the beak and feet; RV13 for the ribbon. I used Spellbinder's Marvelous Squares die to cut the image out and mounted it on melon card stock. The designer paper is unknown from my stash, but I used YR14 to color some of the dots and layered that on apricot card stock. I then layered that on more melon card stock and then ivory card stock for the base. The flowers are a die from Cheery Lynn. I finished the card off with 2 apricot and 10 raspberry goosebumps from Queen & Co.
A wonderful card and I went back to re-read the Emily Dickerson poem. 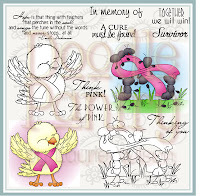 I think we need an oldie but goodie day because I forgot about birdie with the cancer ribbon around neck. Again, beautiful job! Love this card and it makes a statement without any sentiment, I use this a lot with my Chemo Angels cards. Great job. 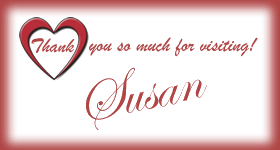 Beautiful, cheerful card, Susan! And what a lovely poem. Thanks so much for sharing with us at CDAC! How fabulous! Such a fun and supportive card. Great job. Being a survivor myself, this one really touches me, Susan. It's wonderful. Terrific use of the colors! This is just a perfect card Susan!! Beautiful Birdie Susan, love the goosebumps! So cute!!!! You are really taking off with your talents...wow!!!! Wish we were neighbors, then you could rub some of your talents on me! Again... this is the cutest bird ever!!! Love the whole layout..